President Chen Junping donated RMB 0.8 million to the project of the construction of Jixi County Nanshan District Jinyin Puchun Road. Hailea Group was appointed as Guangdong Province Patent Pilot Enterprise by Guangdong Intellectual Property Bureau and Guangdong Provincial Economic & Trade Commission. 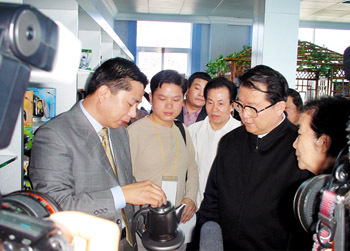 President of Korea Tea Association Mr. Pu Cenkam and his wife visited Hailea Group and highly praised Hailea’s contribution to the development of the world’s tea industry. President Chen Junping met Mr. Liu Feng, President of China International Tea Association and Wu Mengzhao, Guangzhou Tea Promotion Commission in Guangzhou. .
President Chen Junping met the famous Hong Kong businessman Li Jiacheng, who appreciated the Kamjove tea set. Mr. Lu Ruihua, former Governor of Guangdong Province and Member of China State People’s Congress Commission, met President Chen Junping. Hailea was appointed as Chaozhou Municipal Intellectual Property Protected Enterprise by Chaozhou Municipal Intellectual Property Bureau. Hailea Group was noted as the Big Taxpayer by Raoping County Government. Mr. Li Tongshu, governor of Shantou City, met President Chen Junping. Hailea Group was noted as Company Producing High-quality Products. Meanwhile, its small immersible pump, air pump and electric tea set attained the certificate of Quality Guarantee Product. Mr. Chen Bing, Governor of Chaozhou city, inspected Hailea Group’s headquarter. President Chen Junping was appointed to be Chairman of Hong Kong Chaozhou Business Commission. President Chen Junping was appointed to be the Vice President of Chaozhou Charity Association. President Chen Junping was appointed to be President of Hong Kong Chaozhou Businessman Association. Mr. Chen Youqing, Chairman of Board of Asia Finance Group met President Chen Junping. Hailea Group was noted as Exemplar Taxpayer by Chaozhou Municipal Taxation Bureau. Hailea was awarded as Chaozhou Excellent Enterprise by Chaozhou Municipal Government. Li Changchun, member of the Political Bureau of Central Committee and former Secretary of Communist Party of China in Guangdong Province, was inspecting the headquarter of Hailea Group Co.,Ltd, with Hailea’s President Chen Junping accompanied. 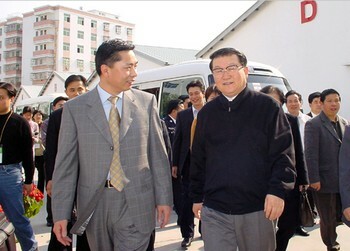 Feb. 28, 2002, Li Changchun, member of the Political Bureau of Central Committee and former Secretary of Communist Party of China in Guangdong Province, was inspecting the headquarter of Hailea Group Co.,Ltd, with Hailea’s President Chen Junping accompanied. Mr. Wang Guangying, Vice President of China Standing Committee of National People’s Congress, appreciated Hailea’s patented products and highly praised those products. Mr. Shi Zhuxiang, President of Hong Kong Trade Development Bureau, met president Chen Junping.